I interrupt our regular schedule with this alert: The New Color of the Year! Pantone has replaced our beloved turquoise with Honeysuckle, a very lovely shade of pink. And I’m THRILLED! I immediately thought of this room from Homegoods when I heard the news. It’s perfection, absolutely. And get this…as you guys know, I got engaged a month ago. We’re planning an April wedding (yes, 4 months from now!) and turquoise and this shade of pink are our colors! 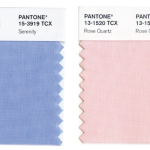 With the Pantone blessing, watch for brand and product marketers to start emphasizing honeycolor pink, both because it’s already trending upwards and it has now been labeled “the” color of 2011. But the selection of a hot color doesn’t mean it will be used to the exclusion of others. Turquoise, the Pantone color of 2010, just happens to look smashing with hot pink, so it will likely continue to be used in 2011. How exciting for us! I LOVE pink and turquoise more than anything! What a vibrant color! And congratulations on your engagement! Pink & turquoise are also my favorite colors – the cherry on the happy color sundae will be if the 2012 color of the year is a cheerful green. Thanks for the Pantone update! I have been wondering what it might be… This is so pretty! I approve! I love it! And I love how these things always come back around. My sister was married in 15 years ago and her colors were the 90s version of Honeysuckle and Turquoise! It's a lovely color, not sure I want it in my home. It will be gorgeous combined with turquoise for your wedding. Can't wait to see wedding plans! I'm decorating my ten year old daughter's room in pink and turquoise. I wasn't going for such a deep pink but after seeing this…I just might. Beautiful. What a great color combination! Congratulations on your engagement! Congratulations, Erin! I'm sure my girls will be excited about this pink appearing everywhere! 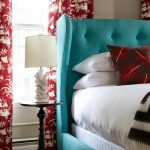 I have been starting to look at pink as an accent with my turquoise rooms, too, and wasn't surprised to hear it was the color of the year… I seem to follow the whim of the masses when it comes to taste in color! Baaaaaahhhhh! April is the best month to get married! I got married this past June (the second best month 🙂 and I graduated this past April (glad to have a good April moment ha). Your wedding with those colors is going to be stunning! Oh, and that room is beautiful! How exciting…and I adore this room – any room with a chaise is perfect in my book!! I love this shade of pink… Thanks for sharing the fun news! We have a Honeysuckle vine here in Australia and it is a lovely creamy yellow! The idea of calling a pink colour Honeysuckle just sounds so wrong to me. Honeysuckle is YELLOW! I would like to know how and why they chose the name. Big Congrats on the engagement. woo hoo I'm excited! I love turquoise, and I love pink!! One of my friends was talking about this today and I love the color! And it along with turquoise is going to be so beautiful! This "… Turquoise, the Pantone color of 2010, just happens to look smashing with hot pink, so it will likely continue to be used in 2011." is truly a saving grace! I am NOT ready to let go of turquoise in any way and am finally happy that we can get so many different things in our favorite color! I love pink, and I do like this shade though its a hair too vibrant for me (I work in such a high-stress field – law – that I need CALMING colors!). I'm with VINTAGE GIRL who said Honeysuckle is a yellow shade – it IS – and will always think "yellow" tones when I hear the word. I'm also with PEACH – it would be awesome if 2012 color of the year was a juicy green! These colors are going to be gorgeous for your wedding, Erin! I'm partial to April as I'm an April baby, it should be a lovely time for a wedding! CanNOT wait to see photos! can't wait to see those invites! Congratulations! I'm sure your wedding is going to be beautiful! Check out my post on this…. Haha, we thought the same thing! I am tickled pink! Congratulations to you both!!! How exciting!!! Lovely! I've used aqua for about 8 years and started adding bits of deep pink (not baby/blush/pastel pink) about 4 years ago. Love they way they work together! I missed the engagement announcement; HAPPY CONGRATULATIONS, ERIN! With you color sense, it is going to be a gorgeous wedding, for certain. May it be a blessed lifetime of love for the both of you!